It’s dark, wet and sometimes feels like the weekend is never coming… so I introduce emergency cocktail Thursdays to beat the almost-weekend doldrums. Our inaugural outing leads us to Hillhead Bookclub just off Byres Road. A perfect choice. It’s a wonderful vast place with high ceilings and refreshing room to breathe. Even with its different levels, booths facing every which way and old fashioned chairs – it feels reassuringly warm and welcoming. You can get up to all sorts of fun at Hillhead – everything from bingo on a Wednesday, vintage fairs on a Sunday and chowing down on delicious food any day of the week. But we’re here with one objective – to explore the impressive cocktail menu. 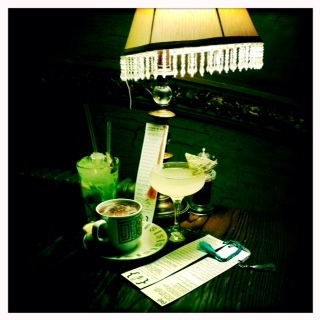 We resist the tempting Book Club Punch served in an old fashioned gramophone and head straight for The Pomeranian. Delicious but over far too quickly. The Red Headed Stepchild is my favourite followed by the Colin’s strawberry Collins. A Vanilla Coke Float tops off our night as a shared delightful dessert. Mission accomplished – not a bit of melancholy remains. Soul-restoring cocktails aside, Hillhead Bookclub is a comforting combination of conundrums. Ping Pong tables, dentist chairs, cocktails in tea cups combine for the perfect offering of ease and relaxation. So shake off those winter blues, face the cold to take comfort in the warmth and wonder of the Hillhead Bookclub. This entry was posted in Bars, Glasgow bars and tagged #inglasgow, About a city - Glasgow, Hillhead Bookclub bar, West End Glasgow, what to do in Glasgow. Bookmark the permalink. Thanks – and you should def check it out!